Back in October (see Here), we started contrasting gold and the US dollar index to the 1980 blowoff top in the precious metals markets. 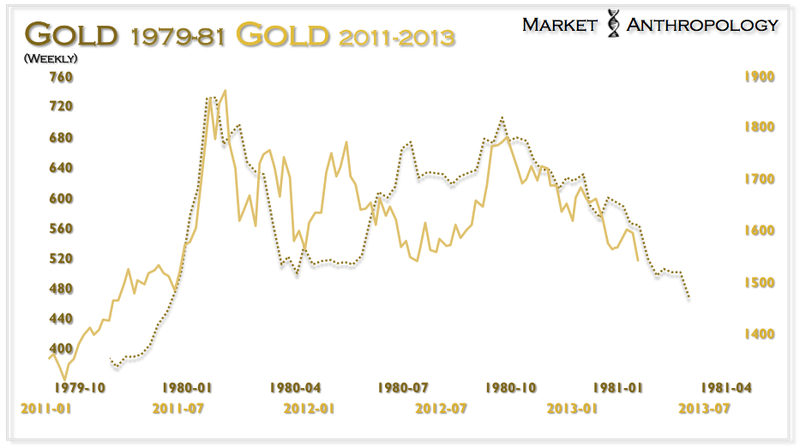 Some six months later, both pivots and the downside trajectory in gold have largely held the line. Over the last decade, as the precious metals bull gained traction and momentum, a tremendous amount of both academic and market driven theses were written and debated about what was motivating the price of gold higher. 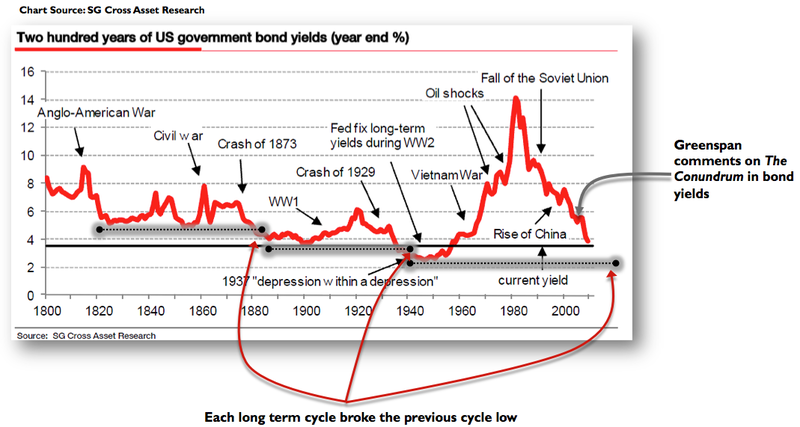 Was it real interest rates, nominal rates, poor monetary policy - the prospect of deflation, inflation - geopolitical risk? 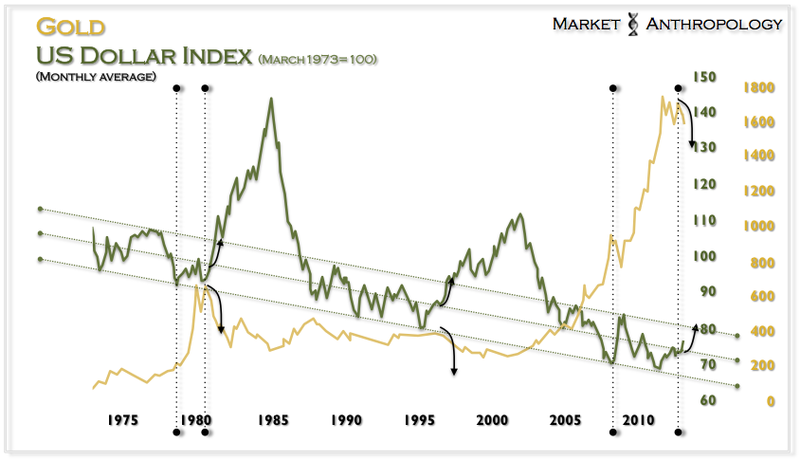 Although we have typically dumbed-down and distilled causations from the currency markets (see Here) - namely the US dollar index and the euro as guideposts for trading gold and silver, you can't help but notice that the culminating geometries of the Everest yield slope may end up being delineated with the backside declines of gold's last two large secular bull runs. 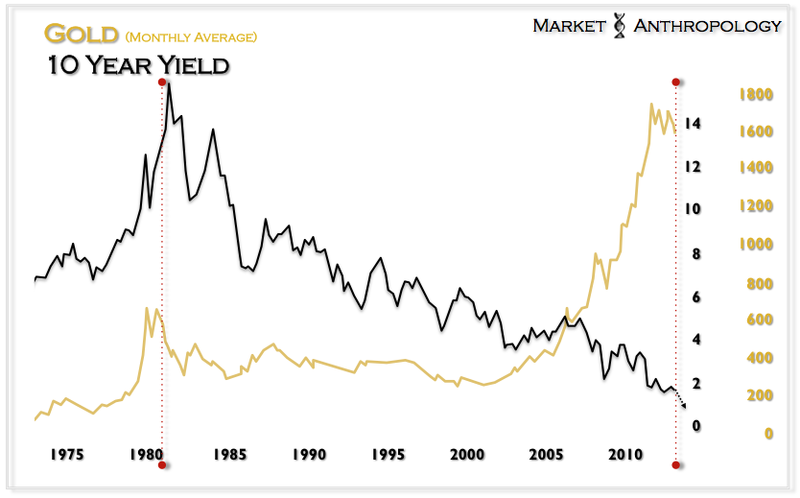 Should this prove to be the case, we would expect gold to continue wilting through 2014 as yields make a final stab at another secular low. What's interesting here - although consistent, is just as Bill Gross was humbled by the bond market in 2011 (expecting yields to rise, see Here) - he once again chose the wrong side of the market in ignoring the broader historical narrative (namely, the US dollar) in recommending a position in gold at the beginning of February (see Here). 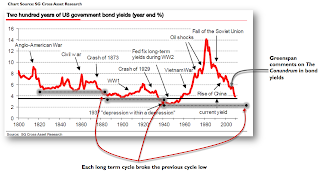 While we would never consider ourselves particularly skilled in the granularities of the government bond market, we do understand form - the historical expression of information, and despite our diminutive bond education - it has kept us on the right side of the field more than most of the experts in the asset class. We expect that over that the next 12 months, our third tenet will reach the end zone when10 year yields eventually tag ~ 1.0% - or the bottom of the historic channel described below. We also believe - as it has in the past, that the yield environment will remain low as the bond market troughs for an extended duration of time.